"Obituary - Joseph Emmett Kollmeyer"
Death location: St. Francois County, Missouri. Note: The below obituary has his birth as January 2, 1886, and the other obituary has it as January 08, 1886. Joseph Emmett Kollmeyer was born in Farmington, Mo., Jan 2, 1886, a son of the late William Kollmeyer and Elizabeth Zimmer Kollmeyer, and died at his home, 321 Pell Street, Farmington, Wednesday April 21, 1965, aged 79 years. He had suffered a prolonged illness. 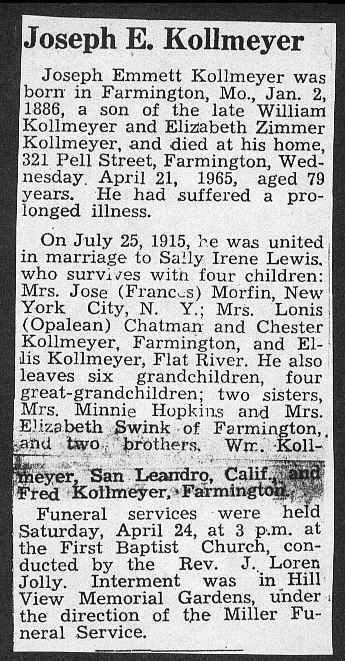 On July 25, 1915, he was united in marriage to Sally Irene Lewis, who survives with four children: Mrs. Jose (Frances) Morfin, New Your City, N.Y.; Mrs. Lonis (Opalean) Chatman and Chester Kollmeyer, Farmington, and Ellis Kollmeyer, Flat River. He also leaves six grandchildren, four great-grandchildren; two sisters, Mrs. Minnie Hopkins and Mrs. Elizabeth Swink of Farmington, and two brothers, Wm. Kollmeyer, San Leandro, Calif., and Fred Kollmeyer, Farmington. Funeral services were held Saturday, April 24, at 3 p.m. at the First Baptist Church, conducted by the Rev. J. Loren Jolly. Interment was in Hill View Memorial Gardens, under the direction of Miller Funeral Services.